It's exciting getting a parcel through the door after a competition win. Usually the postman brings it while I'm at work so it sits there until I come home. The kids urge me to open it as soon as I get through the door and then groan as it's something that is (to them) quite boring - a book, grown up DVD or clothing. Every so often I get something I can share with the whole family and this is the first one to appear on my blog. I love modern family animated films. Until the mid nineties they were enjoyable but usually tied to a particular style, either aimed at girls, boys or young kids. I've watched a lot of the older Disney films as my children grew up and they are great, but I view them through the eyes of myself as a child. The entertainment is nostalgic as we watch and remember how we felt as a child. Toy Story changed that - that added depth to a plotline so that there was excitement, pathos and humour, some of which was real laugh out loud stuff that winked over the shoulders of children at the adults. Always clean, mind. Hotel Transylvania 2 is one of those films. There are lots of full blown laugh out loud, snorting moments and some marvellous slapstick. I caught my wife and mother-in-law laughing lots more than my son. I'm trying not to give away spoilers, so this might be a vague plot description. If you've seen HT1 then you'll know that it tells the story of how Mavis, a vampire, falls in love with Jonathan, a human, who stumbles across their hotel for monsters. 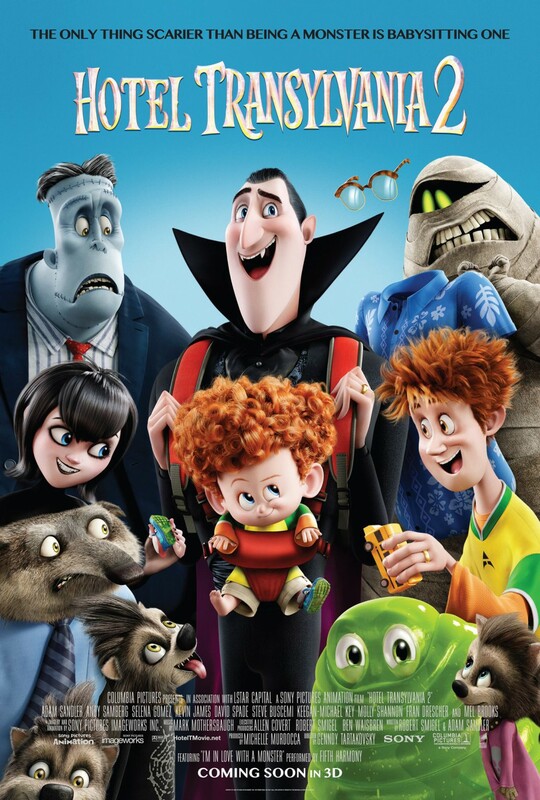 The real star of the piece is Mavis' father Drac (voiced by Adam Sandler) who tries to stop the youngsters falling in love and failing. In HT2 Mavis and Jonathan are married and along comes a little son, Dennis. Is Dennis a monster, or a human? Drac certainly hopes for the former but it's not looking likely so he enlists the help of various monster friends to teach Dennis his monster heritage, against Mavis' wishes. The storyline isn't as robust as the first where the whole idea of monsters and humans sharing the same space was new. This film deals with the conflict of generations where a new generation wants to explore new horizons and the older generation wants to maintain a status quo. It's not heavy though, it's just a good excuse to throw loads of visual gags at us. It may not be a film you come back to time after time, but it's one that'll make everyone smile and even laugh for an hour and a half.